How much does Kings Cross station refurbishment cost? The extension to Kings Cross station is taking shape on the West side. As with any new piece of architecture there’s a fair bit of hagiography in the coverage – it mainly boils down to ‘aaaaaaawwwwww, new station, priddy’ or ‘corrrrrr look at the arches on that’ as Network Rail PRs’ exclusive sneak previews drip out and visitors post pics from their camera phones. No doubt there will be some Harry Potter themed PR in due course. It’s fine to praise a good looking piece of architecture and I would never stint in my praise for the trades that do the fine work. But as Terminal 5 fans found out it’s the real working experience that counts not what it looks like. Also of course in today’s straightened times one always has to ask ‘How much did that cost?’ and it’s corollary ‘How much was it supposed to cost?’. Large capital intensive projects have a tendency to run over budget. In modern public sector construction the budget is just one control factor – time is often more important (see the Jubilee Line extension). Network Rail often buys ‘outcomes’, rather than building to a strict budget. So when you can see you are going to over-run your original budget you just increase the budget, it’s the outcome the counts, instead of just stopping building and doing something much less ambitious. As we saw in the ludicrous saga of their own offices in the Eastern Range it was more important for Network Rail to have nice offices to sit in than build to a budget or just stop building and wasting public money. So how much has the Kings Cross refurbishment cost and what did they originally say it was going to cost? Well it’s very hard to say, the budget for the Kings cross refurbishment is like a bar of soap. I asked the Office of Rail Regulation (as Network Rail is a monopoly and can set prices for using the tracks it is regulated by the government). Over several months (the ORR aren’t quick to reply) i finally got to the Kafkaesque dialogue below where i try to pin down what the work was originally slated to cost and what it is now expected to turn out at making like for like comparisons. Local people with long memories will recall Ian Fry (a Network Rail director) I think saying at a public meeting in Kings Cross that the budget was ‘around £400m’ – he seems to be talking about the ‘enhancement work’ – probably putting on the glass bubble and reconfiguring the passenger flows in 2005 thought to cost £280m. In other correspondence ORR tell me that Network Rail planned to spend £374m in 2010-11 prices. But the out turn of £516 million below includes a fair bit of extra work. It seems that the full scheme now in train was originally slated to cost £485m, now a £31m or 6% overspend. 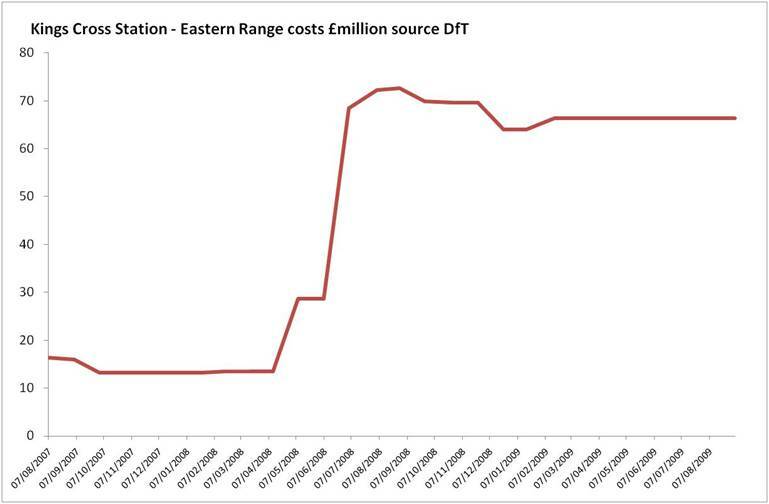 Something here doesn’t quite add up as we know from DfT that their own offices alone overspent by as much as £60m. Maybe heroic efficiencies were made in the scheme. But given this degree of opacity we’ll never know. And remember folks – Network Rail said that they couldn’t afford a pedestrian bridge over the throat of the station which they costed at a bloated £20m. I’d welcome any suggestions as to how to get to the bottom of this and would challenge journalists writing up puff pieces about the architecture in the interests of balance to dig deep into original and out turn like for like budgets. You can build a hell of a lot of primary schools for this money or ten royal yachts. The recent Panorama on Network Rail’s questionable transparency and cost control was in part driven by me revealing this nonsense to them privately. June 2003 Network Rail business plan, £ 624 240 000 in money of the day. The first formal submission relating to the current scheme November 2005, dealt with the enhancement element only for the works at £280M. The first submission to the ORR for the full scheme, enhancements and renewals, in October 2006 confirmed removal from the enhancements element of the LUL contribution for the Northern Ticket Hall of £40M, and confirmed the renewal element to be £180M, i.e. a total forecast of £420M at 2005 prices. It had some exclusions and reflected work scope at the time, (at GRIP Stage 4). Uplifting this figure to current prices using RPI adds £65M to take the total to £485M. The ORR approved figures for CP4 submitted in 2008, which were published in the CP4 Delivery Plan dated 31 March 2009. Hence total figures are CP3 at £170M plus CP4 at £329M. Uplifting this figure to current prices using RPI adds £17M to take the total to £516M. The current outturn forecast, exclusive of third party / non RAB funded works is £514M at current prices. This increases to £547M with the addition of additional third party / non RAB funded works. 5 Responses to How much does Kings Cross station refurbishment cost?